Silver Lake along the crest of the Sierra Nevada. California. 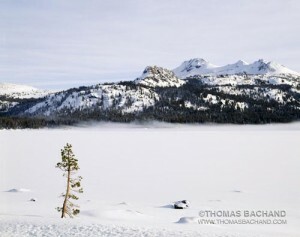 I feel fortunate that Dr. Charles Goldman of the Tahoe Research Group and the Tahoe Environmental Research Center agreed to write the introduction to Lake Tahoe: A Fragile Beauty. Dr. Goldman’s 50 years of study and advocacy on behalf of Tahoe has spawned a generation of scientists researching all aspects of the Lake Tahoe watershed. His work has been instrumental in the founding of the Tahoe Regional Planning Agency, a California-Nevada bi-state agency that oversees all development in the Tahoe Basin. His team at UC Davis has laid the foundation for much of the public policy addressing Tahoe’s challenges and has been at the heart of a model for environmental stewardship emulated the world over. 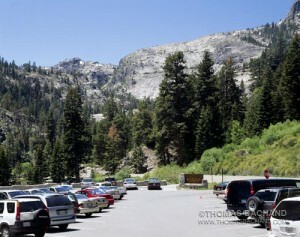 Fifty years ago a man came west to study fresh water lakes and fell in love with Lake Tahoe. Today, agencies, universities, non-profits, and countless individuals have joined the effort to save Lake Tahoe. The government has pledged $1 billion towards the cause. Winter Dawn. Tahoe Keys. Lake Tahoe, California. Every time I set up the camera, my goal is to create a photograph worthy of a patron’s wall. To attract an audience the work must first be beautiful. To persevere, it must be insightful and create awareness. Photographing in the large format tradition with normal perspective lenses subtly conveys the historical perspective. It was the view of many early 19th Century photographers that wide angle lenses distorted reality. To paraphrase Michael Carey Lea in his Manual of Photography from 1871, gardens should not appear as parks. It is a common fiction that the photograph is a neutral witness. Yet, every author has a bias which will find its way into the work. 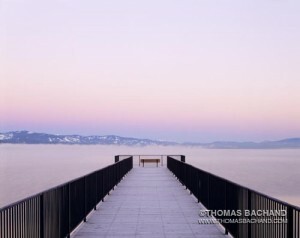 As such, my book of contemporary landscape photography, Lake Tahoe: A Fragile Beauty, is my story. Often discounted is the photographer’s palette, composed of such tools as lighting, camera position, camera format, lens selection, film type, and exposure, not to mention the many variables controlled after capture, during image processing and printing. Less tangible is the photographer’s worldview, psychology, and culture. More useful to the viewer than an explanation of how I take a photograph, may be a consideration of those artists to whom I have found inspiration. In general, I find my work influenced by the historical and I see my photography as a small step in a larger continuum. More specifically, Lake Tahoe: A Fragile Beauty builds upon a number of artists. Eugene Atget, an early French photographer, made “documents for artists,” or, rather, reference photographs primarily for painters. His approach to photography was that of a utilitarian. I find a fresh, unencumbered naiveté in his work, an artist practiced with a new technology. Carleton Watkins is another historical photographer whose work I admire. As part of the United States westward migration, his work has an element of reportage, where he describes the West to eastern audiences. When I first picked up a camera, like many, I was inspired by Ansel Adams. Adams’ approach was a conscious departure from those before. Through his mastery of photographic technique, he was able to stretch the medium – manipulating film, exposure, and development to precisely achieve a desired result. I also frequently find inspiration in artists outside of photography. One such example is painter Mark Rothko, whose use of the color field draws my eye. Richard Misrach’s open skies carry this style into photography. Finally, I would like to acknowledge Larry Sultan, whom I consider a cultural anthropologist. Sultan can take a widely familiar subject, such as that of parents, and through the images of his parents we come to better understand our own parents, families, and our aging culture. Outwardly, I worked with a large-format camera and middle-distance lenses to approximate the historical perspective of Atget and Watkins. On a subtle level this makes a visual connection between past and present. Inwardly, I approach every subject as if it is posing for both a present and future audience. What is the story behind this small slice of the landscape? What am I choosing to include and what do I discard? What is this present moment? Can I be the unbiased, empty witness?